Our Heart Analyzer Cardiocode is designed to measure 7 basic volumetric parameters of hemodynamics, providing in such a way the perfect express-diagnostics of the performance of all parts of the heart, supported by qualitative evaluation of their 12 functions! Cardiocode is an analyzer that is used generally in diagnostics of the heart & blood vessel system, making diagnostics at an extremely higher level that has been never the case before. It becomes possible because we succeeded in implementing our innovative concept of heart cycle phase analysis, and this is the first time in the world! When using our Cardiocode, you will sure enjoy a significant competitive advantage: before our Cardiocode was developed, there was no instrumentation in the world that was capable of measuring blood volumetric parameters in hemodynamics. What is an idea implemented in our heart analyzer? We use a special single-channel lead for recording an ECG from the ascending aorta (a simplified version of lead scheme by Frank). This makes possible to produce a more sharply defined ECG curve, especially in the phases of tension and rapid blood ejection. Innovative is that the appropriate criteria to identify all 10 phases on an ECG curve have been described by us theoretically and applied in practice. Innovative is the application of ECG electrodes to produce an ECG and a rheogram simultaneously. This makes it possible to synchronize the first time an ECG curve and a Rheo by their S waves so that the isoelectric line on the Rheo corresponds to wave S on the respective ECG curve. In doing so, all processes, occurring both before and after opening of the aortic valve, can be evaluated. In the past, the phase analysis was capable of fixing durations of interval QT only. It was impossible to identify the actual cause-effect relations therein. 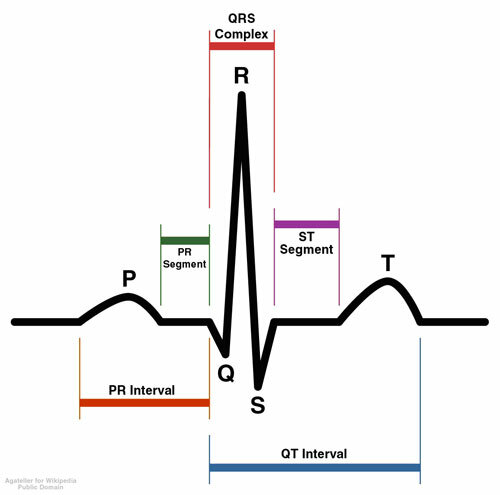 It should be noted that the said QT interval consists of five phases. Our innovative phase analysis theory is capable of making diagnostics in every phase.